Are you seeing yellow, striped, or purple corn? My suggestion is to get to the "root" of the matter. Recently, many fields have received frequent rains and field areas that are more likely to retain moisture, such as heavier soils or low lying areas, as well as compacted areas from equipment, could show signs of stress. 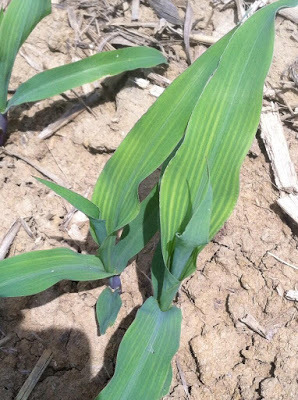 Corn plants in these areas could be stunted, yellow, or purple and appear in distinct patterns within tire tracks, heavily traveled paths or end rows, anhydrous tracks, or in entire fields. Why does this happen? Root function in saturated soil deteriorates because less photosynthates are used by the root. These photosynthates or sugars can accumulate in the above ground plant parts. The higher amount of photosynthates in these above ground plant parts can lead to purpling, which can be confused with phosphorus deficiency, especially in cool conditions. In addition, roots may not be able to take up nitrogen; therefore, they could become stunted and lack color. Some genetics may show more purpling or striping than other genetics, especially before nodal root development - no cause for alarm! 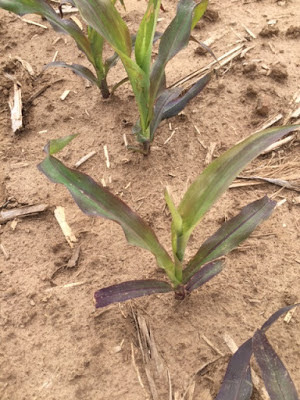 Some dry fields with corn that has compromised root systems could show signs of nutrient deficiency symptoms, not because the soil was lacking nutrients, but because those areas of the field were lacking moisture, planted too shallow, compacted, or are without an adequate root system. In order to determine if a problem is present, roots of the nutrient deficient plants should be compared to roots of healthy plants. In most cases, corn plants were under the V6 growth stage and had not yet developed nodal roots to tap into nutrients. Root growth that is restricted due to lack of moisture or compaction, can lead to stressed plants that show nutrient deficient symptoms. Our advice was to pray for good growing weather and to wait for the nodal root system to develop so those plants could recover. Since root systems are compromised, problems can occur later in the season, especially if it becomes dry and plants are unable to reach subsoil moisture.